Expect to have more Concealed Carry Sling Packs around the end of October. Do you need a way to carry your full size or all metal pistol that is comfortable and accessible? Do you need a rig to store your handgun and have it ready to go at a moments notice? Do you need a high quality bad to carry your emergency or daily essntials that will look good and last a long time? 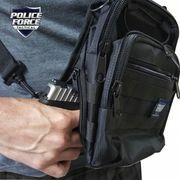 Always be ready with the lightweight Police Force AR (Always Ready) Tactical Sling Pack. This unit is a low profile concealed carry bag that provides quick, convenient access to your firearm and other survival gear. With five pockets, you can carry a variety of items you may need in case of emergency. Three of these compartments are quick access concealed carry compartments equipped with Velcro strips and a removable nylon Velcro handgun holster. These pockets are also ideal for a stun gun, pepper spray, or other self-defense product. There are nylon loops on the exterior of the pack, perfect for a small flashlight, magazine, knife or pen. The elastic bungee on the front is ideal for securing clothing or other items too large to fit in the pack. 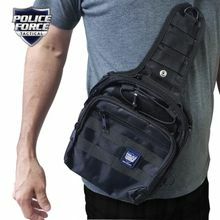 The Police Force AR Tactical Sling Pack is designed for right or left shoulder carry with its ability to clip the adjustable strap to either side of the pack. The pack can be carried as a sling across the chest, directly over either shoulder or by the handle attached to the top. Located on the back of the pack is a belt loop that snaps onto your belt for additional security and stability. The small, practical design of the Police Force AR Tactical Sling Pack will always keep you ready to protect what matters most.